That’s a way to describe two recent policy revisions the Democratic National Committee (DNC) instituted as the party formulates a platform for the 2020 presidential election. In June, the Democratic party voted unanimously to ban campaign donations from fossil fuel companies. Then last week, the DNC sanctioned its superdelegates, stripping the 716 officeholders, state and local party officials, and entrenched Democrats of the honor of casting first-round ballots toward the 2,383 votes needed to nominate the next Democratic presidential candidate at the 2020 Democratic National Convention. This is seen as an olive branch to the more progressive wing of the party that supported Vt. Sen. Bernie Sanders over Hillary Clinton for the party’s presidential nomination in 2016. Two months after the unanimous ban on fossil fuel corporation donations, the DNC voted 30 to 2 to reverse it. 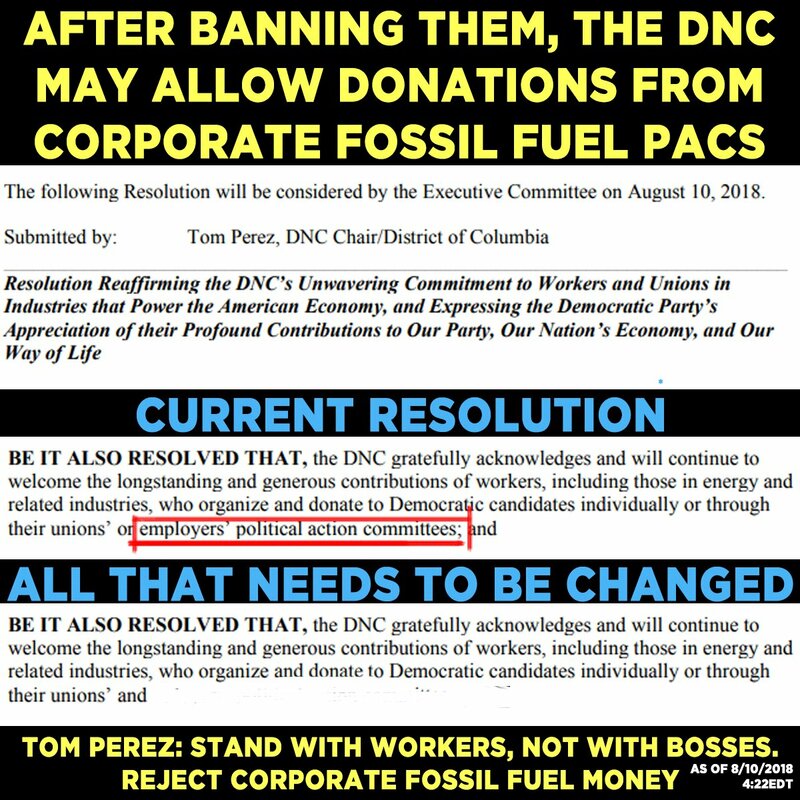 In a series of tweets, climate reporter and contributing writer for The Intercept, Kate Aronoff, argued that although Tom Perez’s resolution purports to strengthen union support, it in fact encourages fossil fuel executives to continue buying Democratic lawmakers’ and candidates’ influence. Credo Action along with myriad other organizations has published an online petition that has already received 56,889 signatures toward a 75,000 goal. If this is an issue for you, let the DNC know by signing. If a Democrat represents you in Congress, perhaps call his or her office and express your disappointment as well.